For the first time ever, a Navy test pilot has flown the Joint Strike Fighter naval variant. Ever since the variant was flown for the first time last June and until now, it’s been a civilian test pilot at the controls. On Feb. 11, Lt. Cmdr. Eric “Magic” Buus changed all that when he took an F-35C airborne from Naval Air Station Patuxent River. The focus of the test flight was to check the function of the flutter excitation system, which will help measure structural loads of the airframe during various flight maneuvers. The test was “coincidentally” timed to take place at the same time as the Centennial of Naval Aviation in San Diego, Calif. (please, folks …). But it was a milestone, nonetheless. See for yourself! 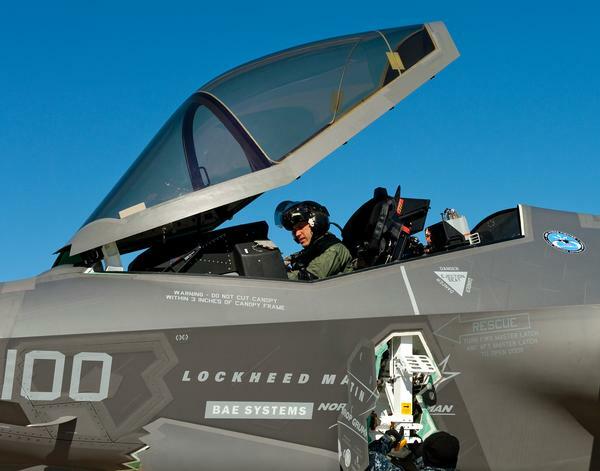 The F-35C is slated to replace the Navy’s legacy Hornet jets. The first Navy F-35 squadrons are forecast to be ready to begin deploying sometime between 2015 and 2018.